THE FIRST AND MOST IMPORTANT CHOICE a new photographer makes is which camera to use. But walk into any shop or browse to any online supplier, and the variety of different makes and styles are completely overwhelming. Luckily, there is an easier way than evaluating every model in every conceivable price class. Cameras come in two main categories: compact and SLR, and by choosing which of these is right for you, you can significantly narrow the choice, making the selection process a lot simpler. A single-lens reflex camera can be identified by the fact that the lens and body come in two separate pieces. The lenses can be bought individually and are interchangeable for specific brands of cameras. This is a tremendous advantage and means that the range of capabilities of the camera can be extended over time, such as with longer telephoto lenses or lenses that allow you to take close-up pictures. In fact, SLRs are better thought of as the centerpiece of a system, rather than as a complete package in its own right. There is an incredible number of accessories and attachments, such as flashguns and filters, dedicated to expanding the range of capabilities of your SLR. As mentioned above, an SLR is more extendable than its compact cousins. It allows the photographer greater control over how the final image looks. Quite apart from the fact that there are more accessories available, an SLR will generally allow the photographer more control over basic camera controls, such as shutter speed, aperture and ISO selection. Whereas compacts will normally automatically adjust these settings according to a built in algorithm, SLRs will allow the photographer to set each individually, while still including the option of letting the camera operate in automatic mode. Furthermore, while most compacts will only operate in autofocus mode, an SLR will allow the user to manually focus the lens. Because SLRs are extendable with a variety of lenses and accessories, they are also more versatile, and can be used in a variety of situations. The larger sensor sizes means that less image noise is generated in low light and that the photographer has better control over depth of field, with larger apertures throwing more of the background out of focus than is possible on the smaller Compacts. Though this is a gross generalization, the image quality generated by SLR lenses are far superior to that available from Compacts. Of course, some Compacts are better than others and not every lens made for the SLR market is of equally high standard, but dedicated lenses at the middle to top end of the market are vastly more reliable and suffer from far fewer aberrations (or flaws) than those built into compact cameras. One slightly archaic difference between SLRs and Compacts used to be that in a Compact the user does not actually look through the lens of the camera when taking the picture. Rather, the viewfinder was slightly of center, meaning that there was always the possibility of falling foul of a parallax error when taking the picture. Today, most compacts do allow the user to see exactly what the lens sees, but not through the viewfinder, rather by displaying the image as it will appear on the rear display of the camera. Though this is a vast improvement over the previous situation, it is not without flaws, and the image displayed on the back of the camera can often be quite faint and hard to discern in bright light. The large, clear viewfinders found on DSLRs still have the advantage. Firstly and undeniably, Compacts are cheaper. Not only is the amount needed to buy the camera far lower, but there is also much less scope for and need to buy accessories, meaning that you will spend far less over time. Perhaps the biggest advantage of Compact cameras, price aside, is the fact that they are just that: compact. The small size and light weight mean that you can take it anywhere and that you are much more likely to be able to carry it with you when going on a long trip or in your pocket or purse as you go about your day to day business. Similarly, Compacts may be a faster option if you need to take a picture in a hurry. With a DSLR and a wide range of lenses, it may take you several minutes to set yourself up. If all you want to do is take a quick snap, or if time is of the essence, you may be much better of reaching for a “point-and-shoot”. Compacts also attract far less attention than bulky black SLRs. Virtually everyone has a little camera stashed away somewhere, and with one of these you can take pictures without anyone giving you a second glance. With an SLR in your hands, you are making a statement, you are declaring to the world that you are there to take a picture, and you shouldn’t be surprised if people took notice. Often when you visit music concerts or stage productions, the ushers will allow those with compact cameras through, but stop those carrying DSLRs. The smaller sensor size of Compact cameras also mean it will have much more depth of field in low light and it enables most models to have a built-in close-up facility. Some may also say that Compacts are easier to use, and as the “point-and-shoot” nickname suggests, in most cases it’s simply a matter of turning it on and pressing the shutter release button. This ease of use does come at the price of limiting the control the user has over the final image, though. Finally, because the lens is never removed from a Compact camera, there is no opportunity for dust to get in and get stuck to the sensor, this is a common problem with SLRs, and the dust can be notoriusly hard to remove. In the great vast world of photography, there is a place for both these formats, all you need to decide is which best suit your needs. As a general rule, SLRs are used by those who are fairly serious about their photography. Whether as hobbyists or professionals, they are willing to take the time to master the camera and its controls in order to get the best possible images. Compacts, on the other hand, are used by those who just want a quick snap, who want to get the job done without the hassle of changing lenses or adjusting the shutter speed. That is not to say that professionals and serious amateurs never use Compact cameras. On the contrary, I know more photographers who have a Compact sitting right alongside their SLR than who don’t, but the fact is that they would use these two cameras in different situations. When they need to get the best picture they possibly can, they will use the SLR, but when on holiday with the family, they might use the happy-snap camera, same as everyone else. This eclectic variety of names all describe the same thing. They all refer to the dirty love-child of the two types of cameras we dealt with above. What these cameras aim to do is to bring together features of both SLRs and Compacts giving you the best of both worlds. What you end up with, however is a camera that spectacularly combines the worst of all possibilities. It is larger and heavier than a compact, yet have none of the extendibility of an SLR. The lenses offer a huge zoom range, sometimes as much as 20x optical, but the glass is generally of very poor quality and images suffer badly, especially due to chromatic aberration (meaning that different colors come into focus at different places on the image, resulting in the edges of subject detail having a colored fringe, commonly purple). Furthermore, the degree of control over the final the image is often quite limited compared to an SLR, while the ease of use and speed of the Compact is sacrificed at the same time. The camera is also more expensive than a Compact but of much lower quality than an SLR. In short, these are not worth the plastic they are made of, and only serve one single purpose: to teach those with more money than sense a lesson. Buy one at your peril. The Lumix DMC-G1 camera is based on a new Micro Four Thirds System standard, which completely removes the need for an internal mirror structure like most D-SLR cameras do. This new system standard reduces the camera’s size by half, which means less weight too (385 grams only). Along it’s features comes available unique lens accessories too (Lumix G Vario 14-45mm/F3.5-5.6 ASPH/MEGA O.I.S. and the new Lumix G Vario 45-200mm/F4-5.6/MEGA O.I.S.). Panasonic has stated that the G1 will come with interchangeable lens in other colors (besides black) to compliment it’s body’s color, and it’s really-cool-gadget qualities. 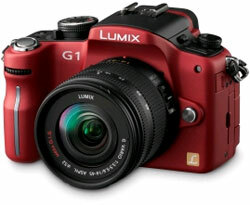 Panasonic’s DMC-G1 will be available in November 2008, and the company will announce the price in October.